When you sign up to receive our enewsletter you will be the first to learn about news, upcoming events & special promotions. We will never share your details with anyone or spam you. Best Value Inn St. Joseph, Missouri is located off I-29, Exit 47. The property is located between Kansas City, Missouri and Council Bluffs, Iowa and is just minutes away from the Kansas City International Airport and offers free high-speed wireless internet, guest laundry and Super-start Breakfast. Free 24 hour coffee, HBO, local calls, continental breakfast, internet access, microwave and refrigerator. Price range is between $51 – $80. Reservations can be made on Expedia.com or by calling hotel directly. The Budget Inn is an economy class hotel property located on the North Belt Highway in St. Joseph. 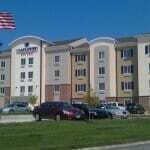 Welcome to the Candlewood Suites hotel in St. Joseph MO. 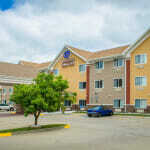 We are conveniently located off I-29 at Exit 50 making it a convenient choice for both business and leisure travelers. The Candlewood Suites is also in close proximity to the following major companies, Boehringer, Heartland Health, Herzog Industries, Johnson Controls and Triumph Foods to name just a few. We have everything you need for a productive business trip in St. Joseph MO. Whether you’re here for a short trip or an extended stay, we provide everything you need. Our services include a 24-hour Fitness Center, free parking and free guest laundry facilities. The hotel is equipped with a 24-hour business center and each suite includes free Wi-Fi access and spacious work area. Furnished for comfort and daily living, the suites at the Candlewood Suites have plenty of space for relaxing, entertaining, or meeting with colleagues. Our full kitchens have the amenities you need to get you going in the morning and to make your evening complete. Our outdoor Gazebo and grilling area will help you relax and unwind after a long day. In need of a quick bite to eat be sure to stop by our 24 hour Candlewood Cupboard that sells value priced items. The Days Inn is conveniently located at the Frederick Exit off Interstate Highway 29 in St. Joseph, Missouri, 35 miles North of Kansas City International Airport, 12 miles East of Rosecrans Memorial Airport, and 140 miles South of Omaha, Nebraska. Lodging includes 25 king and 75 double spacious rooms and 50 rooms are located poolside. The outdoor pool is located in our attractively landscaped courtyard. 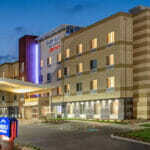 The same city where Jesse James was killed could be the same city you eat a free hot breakfast at the Drury Inn & Suites. There are other cool things you can do at the Drury Inn & Suites, like sleep in comfortable rooms, swim in the indoor pool and enjoy the many free extras! Travel with confidence at St. Joseph, MO’s only Marriott® property, the new Fairfield Inn & Suites by Marriott®. A hotel with outstanding service for an easy and comfortable stay just off I-29 at Exit 50. We are always ready to welcome you to our thoughtfully designed guest rooms and suites with plenty of room to work and relax. Free Wi-Fi will keep you connected during your stay if you are traveling here on business with one of our local exceptional companies, AT&T, Johnson Controls, Frito Lay, Nestle Purina, or Triumph Foods. Before visiting some of our museums, Pony Express Museum or Jesse James Home jump-start your day with our free healthy breakfast, a dip in our pool, or work up a sweat in our fitness center and yoga room. You’ll always find the courteous service you deserve, plus all the little things you expect such as directions to the Shoppes at North Village, Missouri Western State University, or Mosaic Life Care. The Fairfield 100% Guarantee or we’ll make it right is our commitment to you. 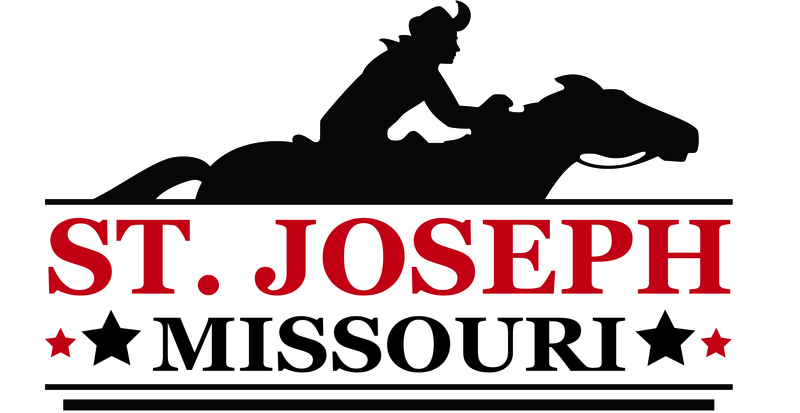 Experience a centrally located St. Joseph, Missouri hotel near area attractions, including the Patee House Museum, Pony Express Museum, the Jesse James home and Missouri Western State University. GuestHouse Inn St. Joseph is conveniently located off Interstate 29 and offers complimentary parking. We are also within close proximity of Kansas City International Airport. Exceptional accommodations at our hotel in St. Joseph, Missouri feature newly renovated rooms and such amenities as complimentary hot continental breakfast each morning, a seasonal outdoor heated pool and modern fitness center. Our hotel also offers complimentary Wi-Fi access throughout the hotel, and handicapped-accessible rooms. Be greeted by our 24-hour front-desk and remember that we’re also happy to provide local suggestions throughout your stay. Come to the Hampton Inn hotel in St. Joseph, and find out why we’re a small town with a huge reputation. You might think that St. Joseph was just another pretty town. Quaint old homes. A lovely parkway running through the city. Nice people. But you’ll find we’re a town stuffed with legends and the legendary. The Pony Express was headquartered here, and you can learn about its history in our town’s Pony Express National Museum. Famous news anchorman Walter Cronkite was born here. The famous outlaw Jesse James died here. Aunt Jemima was invented here. 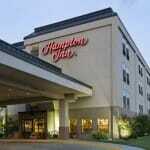 Their legacies are all here, near the Hampton Inn® hotel in St. Joseph, just waiting for you to discover. 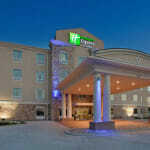 Welcome to the Holiday Inn Express & Suites in St. Joseph, MO. We are conveniently located off Interstate 29 at exit 50 making it a convenient choice for both business and leisure travelers. We are just walking distance from the Shoppes at North Village and an array of dining options. The Holiday Inn Express & Suites is also in close proximity to the following major companies, Boehringer Ingelheim, Heartland Health, Herzog Industries, Johnson Controls and Triumph Foods to name just a few. Whether in town for business or pleasure, our hotel offers modern comfort with a feeling of home. Our nicely appointed rooms include high-speed wireless Internet, 42 inch flat screen TVs, microwaves and refrigerators. 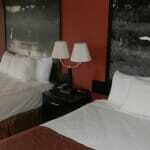 The hotel is also equipped with a business center, guest laundry, meeting space and deluxe suites are available. After your busy day, feel free to take a dip in the indoor heated pool or enjoy your workout in the fitness center. You can fill up at the Express Start Breakfast Bar with a delicious array of hot and cold favorites. Make your reservations to “Stay Smart” at our St. Joseph hotel today! We look forward to welcoming you. Call today and let us help you plan your next Midwest getaway! The Motel 6 in St. Joseph is located 2.0 miles east of downtown St Joseph and is visible from I-29 and Exit #47. Hotel amenities include, free local calls, free morning coffee, free expanded cable, kids stay free, pet allowed, handicapped accessible rooms.  The Comfort Suites® hotel in St. Joseph is ideally located with easy access to area attractions and businesses, including the Pony Express National Museum, St. Jo Frontier Casino, and the St. Joseph Civic Arena. Guests of the hotel are invited to take advantage of the exercise room, indoor pool and hot tub. Business travelers will appreciate conveniences like access to copy and fax services and competitive corporate rates. 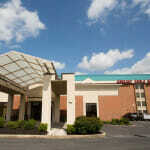 This St. Joseph, MO hotel has meeting facilities available to accommodate most events and business functions. Treat yourself to a rewarding stay at the Red Lion Hotel in St. Joseph, a full-service hotel fronting the Missouri River in the historic downtown district. With excellent on-site dining and conveniences like free Wi-Fi, an indoor pool and a fitness center, we have everything you need to feel right at home during your visit to downtown St. Joseph. Our hotel’s ideal location off I-229 affords easy access to Kansas City International Airport (MCI) as well as premier attractions like the Pony Express Museum and the Jesse James Home Museum. Additionally, our building rests atop the historic site of the first Pony Express weigh station, which handled mail all the way from the California coast. Featuring a 24-hour business center, a sauna and in-room dining, the Red Lion St. Joseph provides the perfect home base for your upcoming trip to Missouri. Conveniently located off I-229 just 40 miles north of Kansas City International Airport. The Stoney Creek Hotel and Conference Center and St. Joseph, Missouri, were made for each other. In this city where the Wild West really began, you’ll find the Stoney Creek with its 129 great rooms and Western-themed suites will take you back in style, to the days of Jesse James. As one of the newest hotels in St. Joseph, you’ll not only love our uniqueness, you’ll appreciate our nearly 11,000 square feet of flexible meeting and banquet space designed to enhance any business or social event. From family getaways to professional accommodations, you’ll be pleased with your experience. Pony on up – to St. Joseph’s Stoney Creek. (and smile when you say that, pardner! ).